Some books I read. Sitting up in bed, lying on the love seat in the kitchen, leaning back in a chair in the ski lodge following the story, page after page. But every once in a while, a book comes along that I pore over with pencil in hand, not just reading but studying, like an educational life course, marking line after line as if there will be an exam at the end. Magical Journey is just that sort of book. I’ve sent copies to my mom, to my sister, to my aunt, to my yoga teacher and to several friends. I wish I could send a copy to every one of you. Katrina writes about loss and grief and the tears that trickle down her cheeks onto her yoga mat. And she writes about love. When you strip everything else away, Magical Journey is about love. It’s her story, but it’s my story, and yours, too, just in a different town, in a different kitchen, with a different family, in different circumstances. Katrina is such an exquisite writer that I’ve been reluctant to write this post, afraid that my words could never do hers justice. So rather than try, I’ll let Katrina’s words speak for themselves by including a few of my favorite passages. But first, I want tell you why Katrina and her books are so important to me. Because long before we met in person, Katrina had been one of those magical helpers on my journey. You see, it was two days after Andie’s birth that I found Katrina’s first book, Mitten Strings for God in the hospital gift shop. That book became an ever present guidepost and reminder of the gift of motherhood, teaching me to remember childhood is precious and fast and that raising my children with presence is the greatest gift I can bestow upon them and myself. 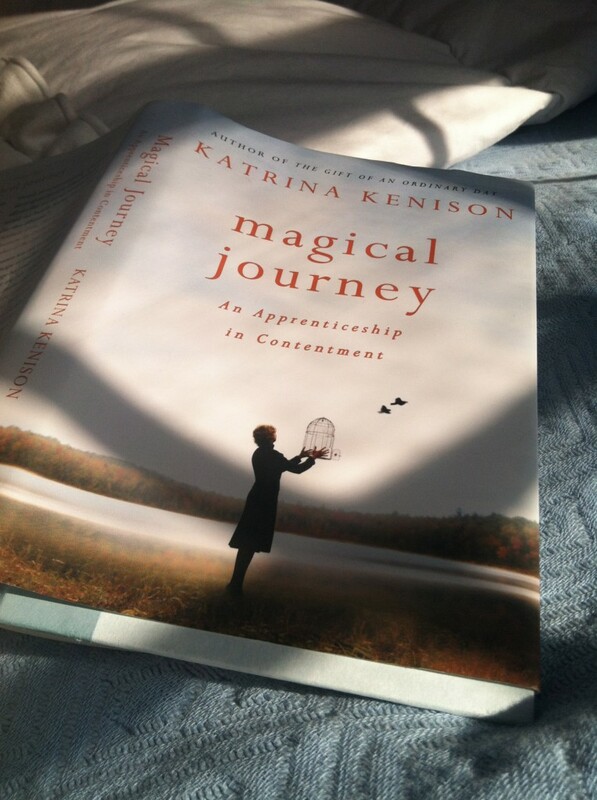 And then Katrina wrote The Gift of an Ordinary Day, chronicling her journey with her adolescent children, preparing me for what was to come (and has) in my life. And now, Magical Journey. It’s about her journey into mid-life, a place I have yet to reach, but a place I don’t yet need to be to feel and comprehend and devour this story. Because Katrina has pulled the curtain so far back on her inner-emotions and feelings, at times I felt almost embarrassed to be reading such intimate details about her life. There is so much more I could say, so much more I want to say, but instead, I will say just say this, Read this book. It is truly a must for anyone seeking a fuller, more profound existence in life. Katrina has generously offered a signed copy of Magical Journey for one of you and I’m giving a copy of Mitten Strings for God away to another lucky reader. Leave a comment below and as always I’ll let Random.org do the choosing. In the meantime, as promised, here are a few of my favorite, underlined passages from Magical Journey. From the chapter titled Stillness, Katrina writes, “To be human and alive, it seems, is to strive and to struggle, to learn and to grow even as we endure our losses and question our ability to transcend them. It’s easy to think we should be somewhere or someone else – smarter and wiser, or further along on the path, closer to having an answer. Instead we muddle along, heads down, certain everyone else must know something we haven’t figured out yet.” Oooh, I love that so much! Totally reminded of my word of the year, Enough. And also from the chapter Stillness, “My first inclination always, when the tears start, is to jump up and get on with things…But making the choice to just hang in there with my own rather pathetic self for a while demands a different kind of perseverance altogether, a kind of strength that lays bare all of my weakness. And so I try, day after day, not to scorn this raw, sorrowful soul, not to dry my eyes and bolt, but to settle into the darkness instead, heart open, experiencing the humiliating truth of my own silent, barren place.” What an incredibly important lesson. It’s all about the love. It always is, isn’t it? If you want to order Katrina’s book, click here and if you’d like to read more of her gorgeous writing in her weekly blog posts, head on over to her website www.katrinakenison.com. Remember to leave a comment if you want a chance to win a copy of Magical Journey or Mitten Strings and a huge congrats to Renee, the winner of the Winter Jamms Hat Giveaway!